Last week was all over the place and I struggled a bit with consistency and sticking to the plan. In some ways that was good, and due to fun things like going for a nice long run with Coach Dave and Jenn. In other ways that was due to un-fun things. Overall, I've been sticking to the plan to work on bringing the happy back and to take care of myself. Monday: Up for my Monday morning Brick. I spent about an hour on the bike with two blocks of Z3-4 riding for 20 minutes. Then I laced up my running shoes for a 5 mile run. It was exactly what I needed. Running through the Arboretum was so peaceful, with only the sound of crunching snow to accompany me. The time change has meant that I get to see the sunrise on my morning runs, and I like that. A great way to start the day. Tuesday: A nice, long-ish swim, 4600m, to kick off the day. We did another set of 24x100, this time 4x100 with descending intervals of 1:35, 1:30, 1:25, twice through. It felt easier than the 24x100 the previous week. Wednesday: I met up with Jenn and Coach Dave for a ~15k run (8:15 average pace). It was a beautiful night with great company. I struggled with some GI issues in the first half of the run, but my stomach finally settled and things became much more enjoyable. It was a good reminder though that my nutrition choices matter a lot and that I need to take time to make sure I'm fueling my body properly. Thursday: Turned into a rest day. I had originally had a ride planned for Wednesday and was hoping to switch it out for Thursday, but coach said to just rest instead. You know it is a good sign when you're at the point where you are sad to miss your bike workout, because you feel like you're making progress and actually really enjoy biking, even if that means spending time on the trainer! Woo! The rest felt great in the end though. Friday: Good intentions, but when I woke up to swim, I felt horrible. It was that time and I had the absolute worst cramps ever, plus a headache and lots of muscle soreness. I crawled back in bed instead of heading to the pool. Saturday: An awesome track workout! I felt great (maybe since I'd had two days off haha), and was hitting my paces like I actually knew what I was doing. The workout was 4x1 mile at 10k pace with 2.5 minutes rest between. My pace was right on the whole time and I felt really relaxed and confident. Sunday: I took a barre class. After teaching Thursday, Friday, and Saturday, I felt like I wanted a turn to burn and shake. It was a good class, followed up with a delicious lunch at the new Pure Kitchen (owned by the yoga studio I used to go to) with Gilly! We had a great time catching up. I'll definitely go back to the restaurant too, yummy! In the evening, my roommate's boyfriend cleared the snow away so we could have a BBQ. I made a tasty sweet potato and cauliflower salad. Recipe is posted on K&K Test Kitchen. And another exciting part of the week was the release of the "sneak preview" of the Summer 2015 lines that will be available at Sports Experts, a Canadian sporting goods chain. I got to play "runner model" for a few days and wear all the new summer running clothes. All of the models are real athletes, and I got to work with some track athletes and another triathlete. It was a lot of fun, so it's cool to finally see some of the results of our "work." I appear a few times, wearing pink both times, from the 1:02-1:06 mark and the 1:22-1:25 mark. Nice job this week!! It is always good to listen to your body and rest when you need it!! :) Awesome track work-out! Mile repeats are tough! Way to kill that work out!! 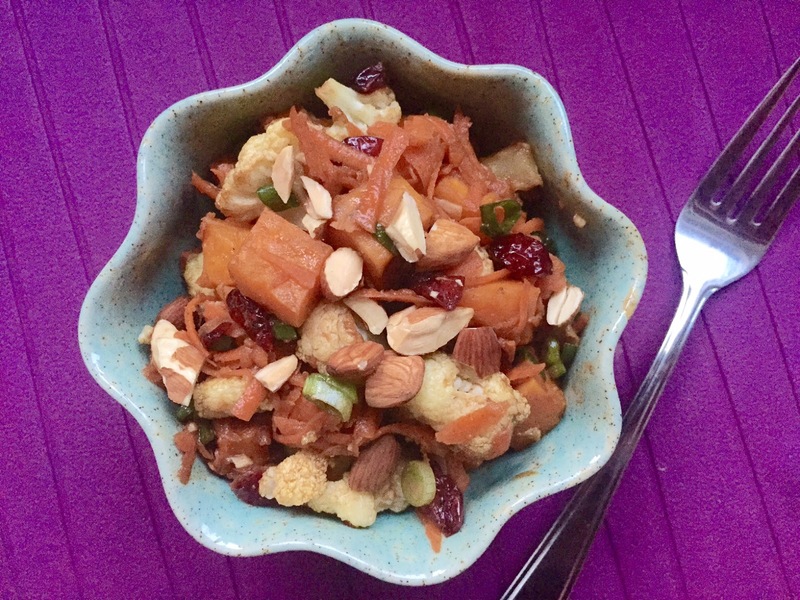 The sweet potato/cauliflower salad looks amazing too!